The Model 660 is solid body guitar with Deluxe features. Gold pickguards and checker black and white bound body. 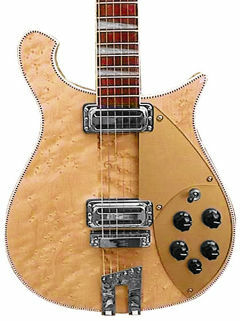 The white bound neck is wider than on the "normal" Rickenbackers, 44,5 mm at nut (41,3 "normal") and 52,4 at 12th fret (49,2 "normal"). Vintage Rickenbacker reissue pickups. The fretboard has 21 frets and pearloid triangle markers in the style of a 60's neck. Also available as a 12-string version 660/12. See also 660/12TP.